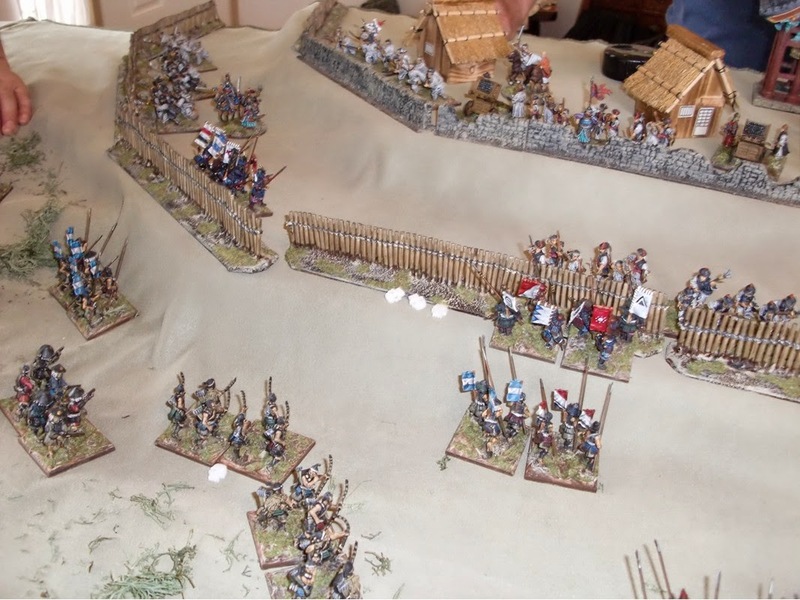 A few more Litko movement trays - this time for cavalry in skirmish formation. 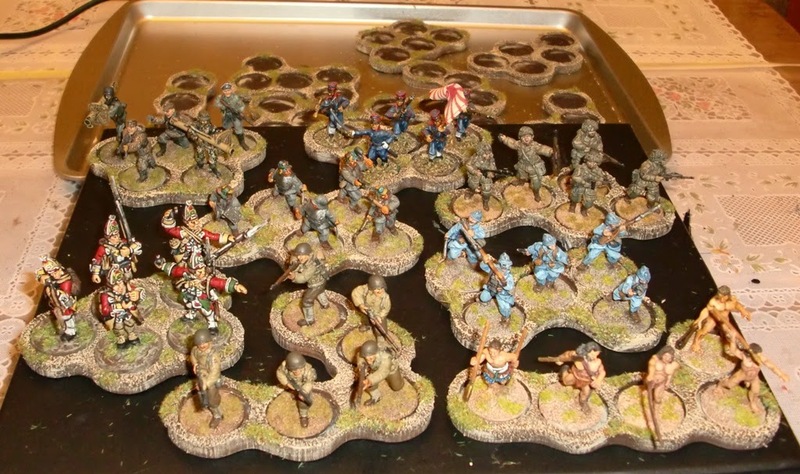 These were the three remaining such trays on sale from FRP Games. They arrived within a week from ordering; guess I've been really lucky with my orders, as others have mentioned slow delivery. Maybe it's because I'm just two states north of them. 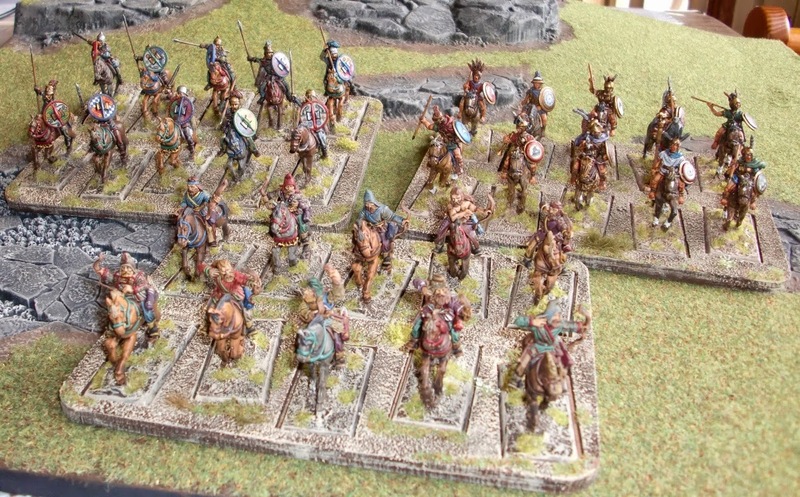 The cavalry are a unit each of Scythian bowmen, Celt/Gallic warband and Tarantine light cavalry. The Scythians and Celt/Gauls are Old Glory, and the Tarantines are mostly Redoubt. They've all been used in games as part of a Successor army. The figures are on GW style bases. In addition to the trays individual bases for each cut out are also supplied. I intend to use some in conjunction with 50mm squares for various formations. In a continuing effort to organize figures for easier handling, both in gaming and also storage, I used up some leftover 50mm round bases from Litko. I had just enough to re-base the mostly The Assault Group (T.A.G.) Early Samurai cavalry I've had for several years. The lone monk is a Kingsford from their excellent line. These had been gamed many times as singles in WAB and modified-WAB games in the past. 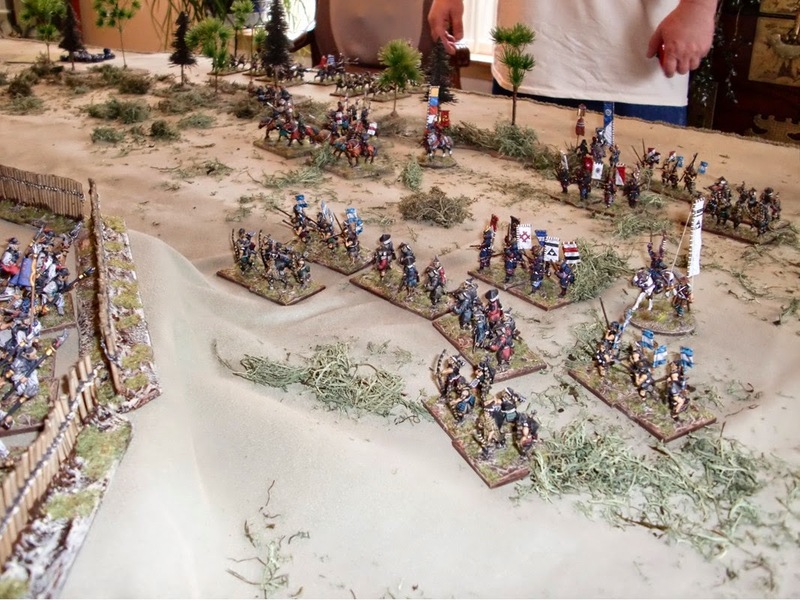 As this period suits smaller scale skirmish best, I wanted them based for ease of play in this respect. Having two per round base seemed like a good enough idea. So, here they are in a few gratuitous photos. Besides static grass, Army Painter grass tufts and flowers have been added to the bases to jazz them up a bit. The large banner is based upon one supposedly associated with Minamoto Yoshitsune - the hero from the Gempei Wars of the late 12th Century. The large white horo has markings from the Minamoto clan - the horo was scratch-built using Green Stuff. They were painted several years ago - when I used to paint eyes - which nowadays are reserved for character figures only. The rear shot above shows off the various lacing patterns on the o-yoroi - or great armor of the period. There isn't evidence that the patterns were anything like European heraldry, and more on the whim of the wearer. 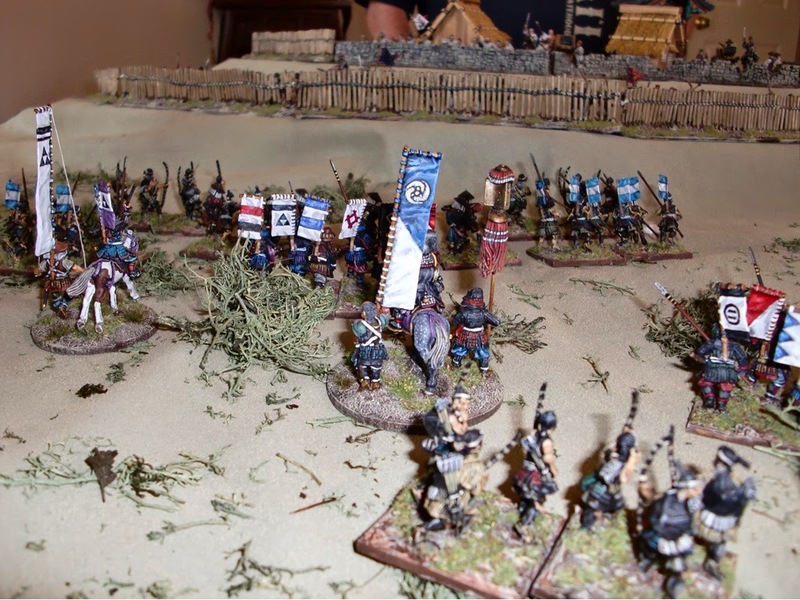 Below is yet another gratuitous image - this time with the foot troops - on Litko skirmish trays; both samurai and chugen (pre-Ashigaru types). They are a mixture of T.A.G., Kingsford and Curteys; which mix well together. 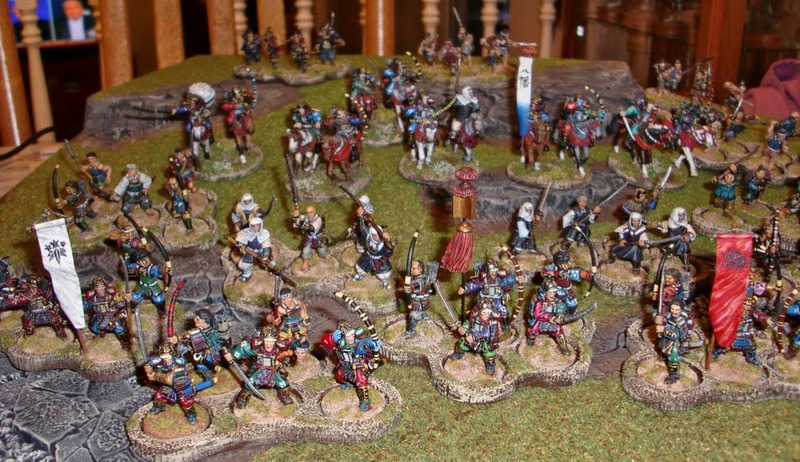 I feel fortunate to have not only met Mike Curtis of Curteys, but actually played against him at a WAB tournament last year.The figures are on a GW board with skulls which do not look inappropriate. If I were still into this period, I would've liked to have added some West Wind figures from their nice range also. Siege of Haengju Play-Test - Success! Well even with multiple last minute player cancellations, the game still managed to go off with two players. Pat L. and fellow expat Hawaiian James (Kimo) showed up to give it a go. James is a former White Rock Gamer from Vancouver, B.C. He now lives a few miles away from me - he was an Infantry platoon leader in Vietnam and a member of the local chapter 407 of the Military Order of the Purple Heart. This was James' first time playing Hail Caesar, but got into the flow very quickly. Pat chose to run the besieging Japanese and James ran the defending Koreans. At the top of Turn 1, Pat ordered his three divisions to turn to their left with the objective of assaulting the flank of the defended position. His first division commander failed his command roll and basically bottle-necked the rest of his two divisions who had successful rolls. Three Japanese divisions attempting to march to their left for an assault - the division on the far left failing to achieve this initial move stymieing the overall army maneuver. The Koreans followed suit by attempting to shadow the Japanese's movements. James actually rolling a 12 for a Blunder with the first of his three division. He subsequently rolled a 1 on this D6 Blunder test and gained a casualty for one of his units in that division. This is a result from a simplified Blunder table for the game. Turn 2 had the Japanese deciding to move towards the defenders with some long range missile fire - not all of which were successful as the barricades provided covering saves. Turn 3 allowed the Japanese to move up closer, with not too much worries from the poor missile fire from the defending Koreans. 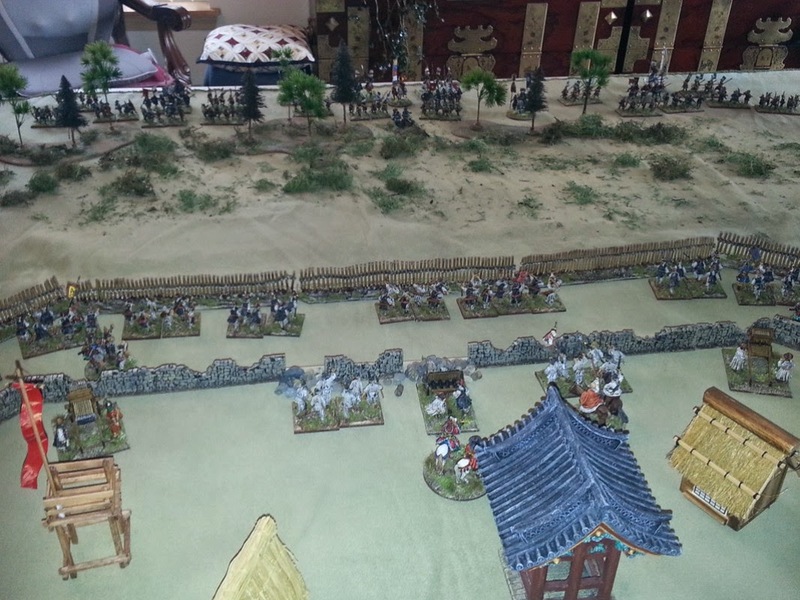 Ming Chinese and Korean cavalry were allowed to attempt to enter the fray on the Korean's Turn 3, but failed their command roll to come on. In fact, they never were successful to enter the battle for the entire game of 6 Turns. This actually is historical as they never appeared at the actual battle. By Turn 5, the some Japanese units were able to charge the outer barricades and defeat a unit of Korean defenders, thereby allowing them to move into the outer defense works. The Koreans did manage to destroy an Ashigaru unit or two in the process though. The Korean's Victory Condition was either to destroy 50% of the Japanese or keep them out of the upper level of the fortress. Another view of the close combat going in inside of the Korean's outer defense work. This is historically accurate, as the Japanese did indeed manage to break into the outer defenses. The top of Turn 6 had a Samurai unit enter the top tier of the defenses after wining their round of combat. The victory condition for the Japanese was to have one of their units reached the inner/topmost portion of the defensive position and retaining it at the end of Turn 6. This they did and the Japanese were declared victorious - unlike the historical battle which ended in severe casualties and defeat for them. 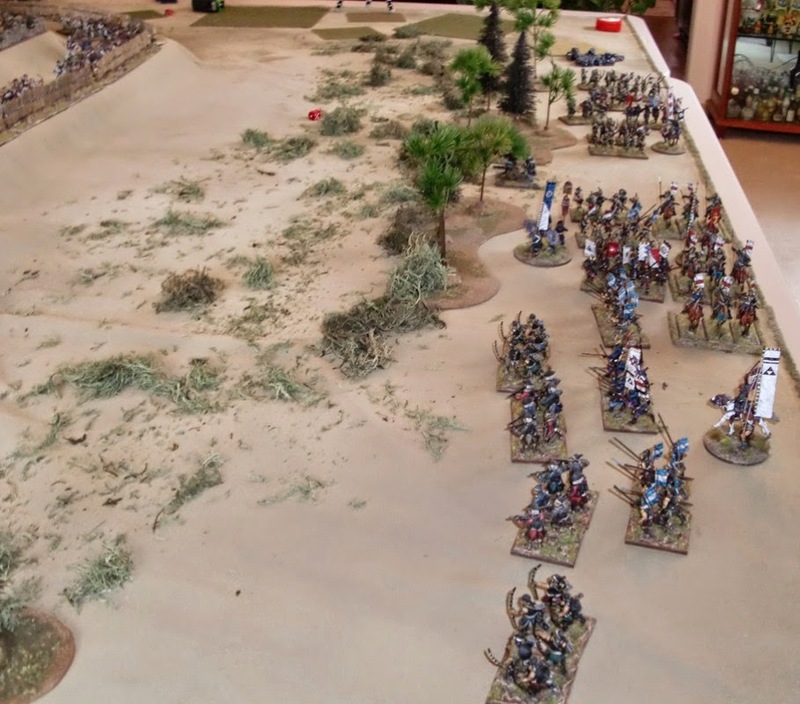 A unit of Samurai inside of the inner defense work at Turn 6 - retaining it until the end of the Turn and thereby achieving Victory for the Japanese. Both James and Pat agreed it was a fun game and should work very well at the convention next month with little or no modification to the rules as is. The one thing that could've added a lot of friction would've been if the Ming and Korean cavalry were able to enter the game and cause some trouble to the attackers. It was suggested to leave them out of the game completely, but I plan to leave them, but maybe allow them to come at Turn 4 - contingent upon a successful command roll. 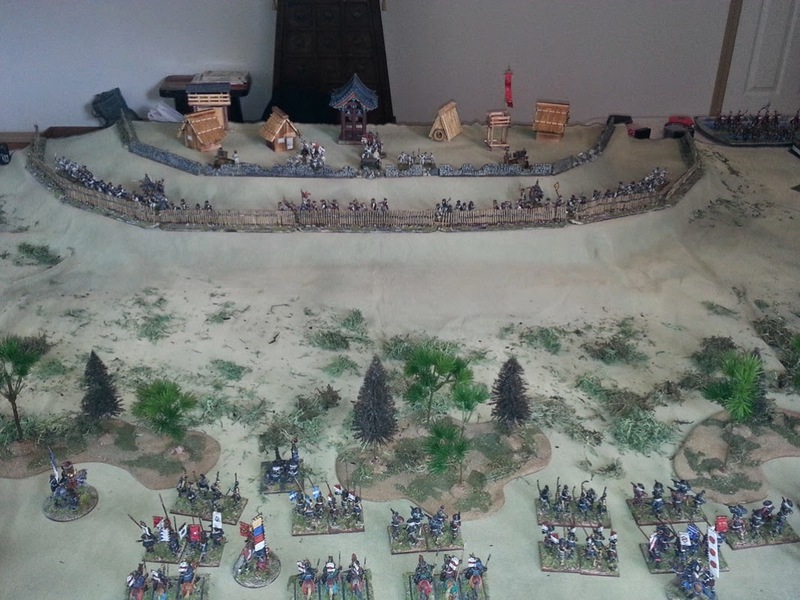 Siege of Haengju - Ready for Play-Testing Tomorrow! 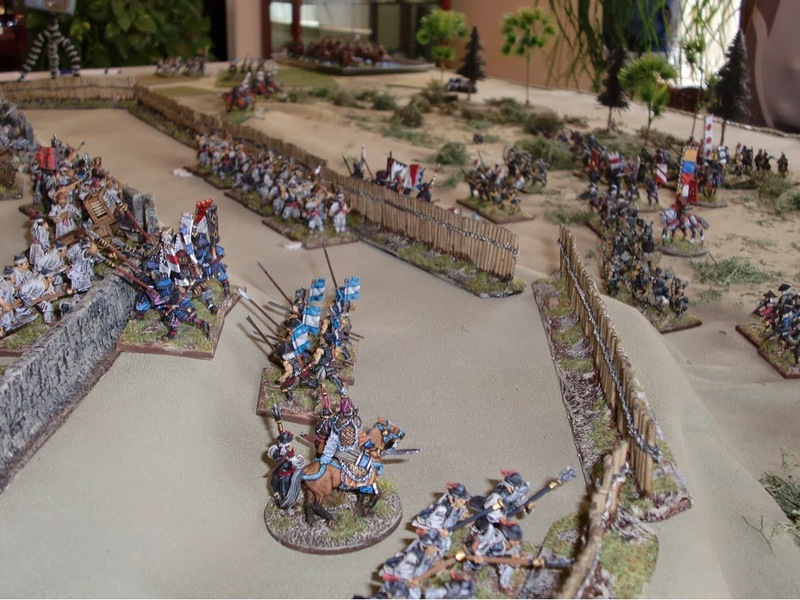 Well, we're finally getting to get in a play-test tomorrow for the Siege of Haengju game I've committed to hosting next month at our local annual convention, Enfilade! Out of the initial six or seven players, only about half will be able to make it tomorrow. That said, it should be fine as the ones making it are very experienced gamers, and in systems that I've based the rules upon. The rules for this game are a modified version of Hail Caesar with doses of WAB and DBA mixed in! Here are a few shots of the table set up - pretty close to what I had set up back last December (for a game that never materialized), but with the addition of more command stands and another Korean artillery piece. View of the Korean defenders - an outer palisade of stakes and inner stone wall from the older, original fortress of an earlier era. 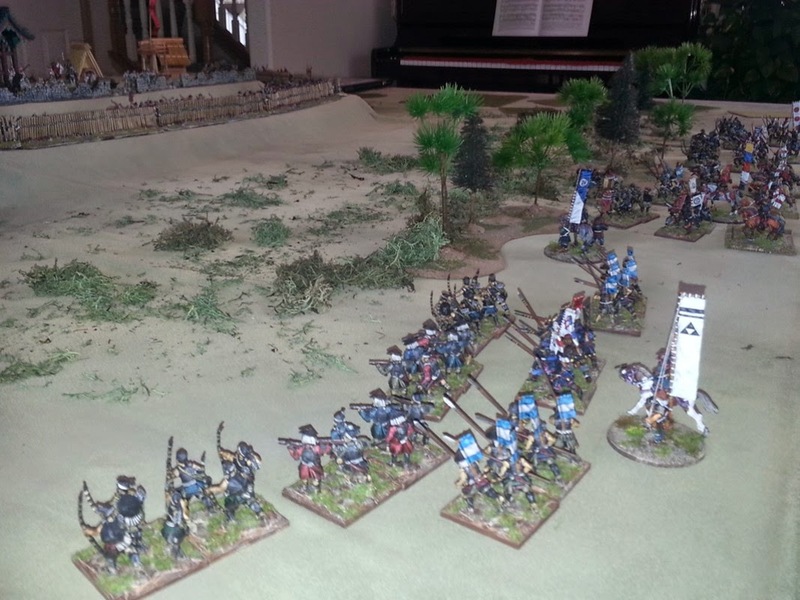 A view from the side of the assaulting Japanese. 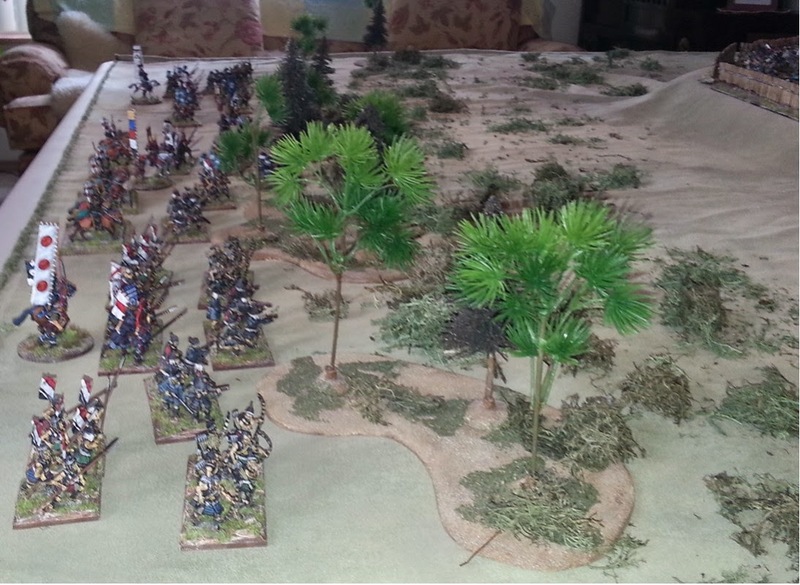 The area directly in front of the Japanese are wooded, but passable for the cost of an entire move. To their right are rice fields which will also cost an entire move for small fields and two for larger ones. The walls also cost an entire move to overcome. Quite simplified rules, but geared for convention players with little or no experience with Hail Caesar. A view from the heights of the Korean defense system. Their artillery are all able to fire overhead their own troops from the higher elevation. As may be surmised by the photos (blurred as they are), units are mostly two stand apiece so relatively "small", but since they are structured this way can be considered "Standard" sized per Hail Caesar. The right of the Japanese attack. The woods provide cover (+1 Save), but only hinder movement by costing one move as none of the wooded areas are greater in depth than the 6" normal movement of infantry. 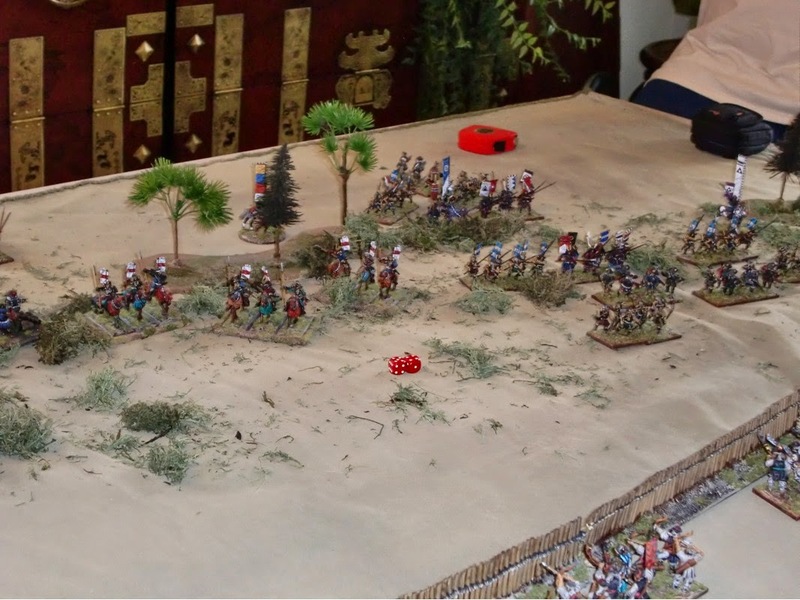 The Japanese cavalry can still use their full 9" move for wooded terrain also - all units in the game are considered Open Order troops except for the Chinese Heavy Cavalry. 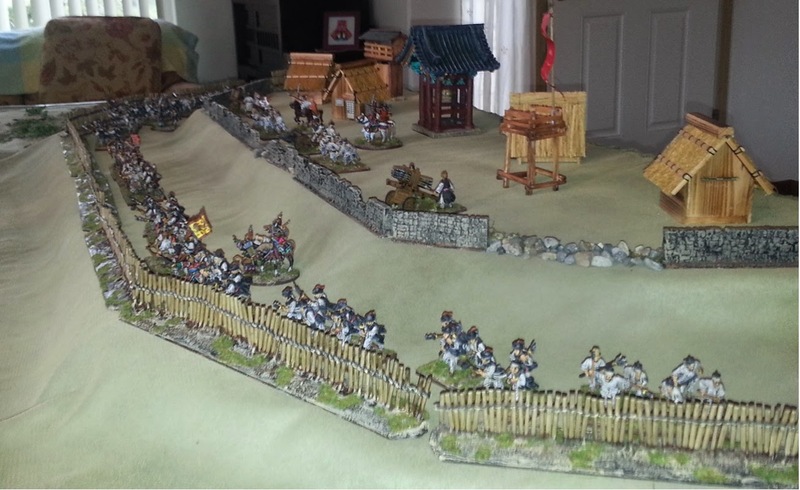 The Korean and Chinese cavalry will be able to come on in Turn 2 of the game - contingent upon them having successful Command Rolls. A view from the Japanese left - there are three divisions for the Japanese; each with a mixture of arquebusiers, archers, spearmen and Samurai. The center division also has cavalry and the one cannon for the Japanese. 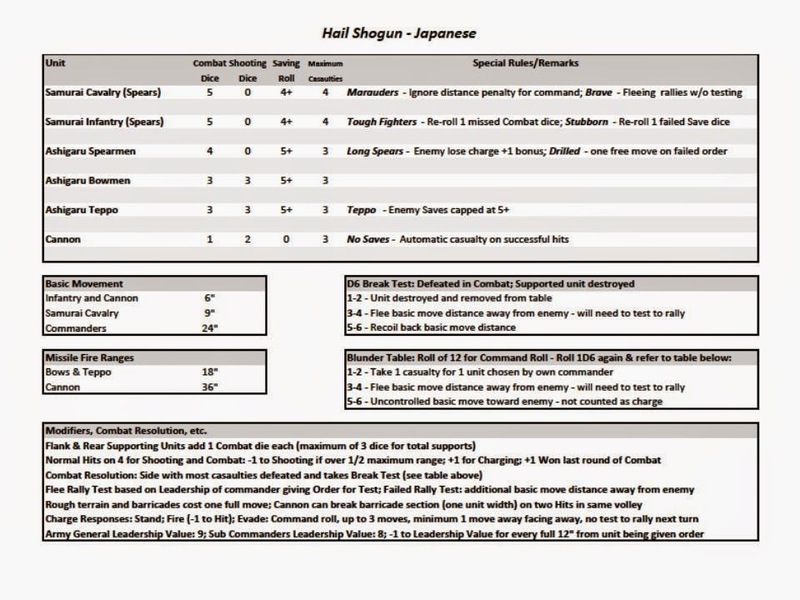 Both the Japanese and Koreans have three divisional commanders and an overall army general who can choose to lead units/divisions at will. Some of the modifications to the basic Hail Caesar rules are the removal of Disorder, the simplification of Combat resolution, Break Test and Blunder rolls. All will have only three outcomes - the Combat resolution and Break Test will be both based loosely upon DBA: D6 roll of 1-2 results in the offending unit being destroyed and removed from game; 3-4 results in fleeing a basic move distance away from combat/enemy, and needing to a leadership test to rally their next turn (as in WAB but also requiring the use of a successful Command roll from an appropriate commander to take the test) - failure will have the unit to move yet another basic move away; 5-6 resulting in a "Recoil" back of a basic move distance (similar to DBA). Blunder test results (from rolling 12 in the Command roll as normal) are 1-2 having the unit take one casualty; 2-3 Flee one basic move distance away from the enemy - automatic/free rally at top of their next turn; 5-6 Uncontrolled basic move (surge) toward enemy, but not counted as a Charge. All foot units will have a maximum Endurance (max casualties) of 3, except for Samurai units which will be 4 as all cavalry. Charge responses are similar to WAB also: Stand, Fire (if bow armed, and -1 to Hit); Evade - based upon Hail Caesar - requiring a Command roll for up to 3 moves away, but still have one free move if roll failed; and if overtaken by the Charging unit will be destroyed. 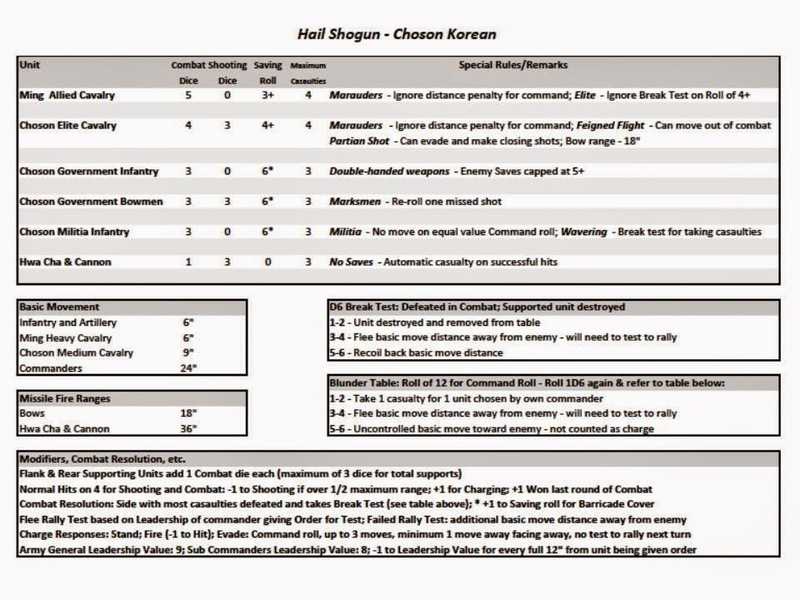 There are a few Special Rules and various Saves for certain troops, but still pretty simplified rules and they all fit on a 8.5 X 11 inch page, one-sided. Taking advantage of FRP Games' sale on Litko stock I picked up a couple of packs of horde trays at a 40 percent discount. I also ordered some magnetic inserts for the trays. The packs come with 8 variously shaped trays that hold 5 25mm diameter bases each. 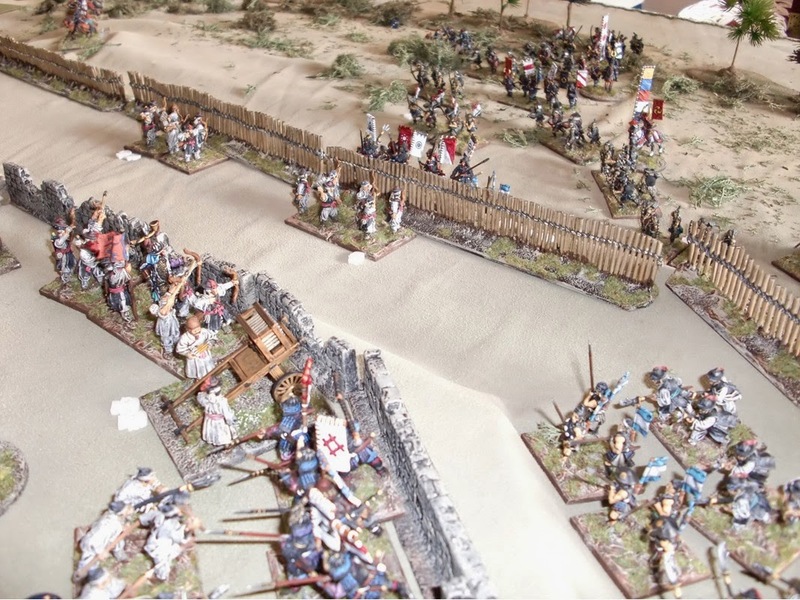 The total of 80 figures is enough for most skirmish games intended, including Bolt Action, Muskets and Tomahawks, as well as skirmishers for Hail Caesar and the like. Here are various figures based on metal washers which complement the magnetic inserts. I had pondered the thought of rebasing these singly-based figures as I dislike moving individual figures in games, so this solved the dilemma very effectively. A gratuitous photo op to be sure, but since I've not posted in some time it felt a bit obligatory. For the record, I'm very pleased with Litko products - not only for the high quality, but the pricing as well.